Created in 1746, Johnston County is located along the fall line between North Carolina's Piedmont and Coastal Plain regions. Smithfield, on the Neuse River, has been the county seat since 1771. 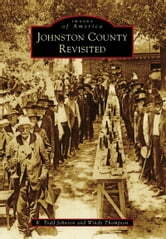 In 1856, Johnston County became part of the Fertile Crescent along the east-west North Carolina Railroad, which spawned the thriving towns of Princeton, Pine Level, Selma, and Clayton. In the 1880s, a north-south rail line, eventually known as the Atlantic Coastline, brought Kenly, Micro, Four Oaks, and Benson into existence. Johnston County boasts film legend Ava Gardner, bootleg kingpin Percy Flowers, Vicks VapoRub, and other local claims to fame. It is still a farming county, although recent growth from the Research Triangle region has brought marked changes to the rural landscape. In recent years, Wilson's Mills and Archer Lodge have gained corporate status. These historical images tell a story not only of the extraordinary people who have called Johnston County home but also of the ordinary, everyday individuals who have left their mark.